Interaction between a dwarf galaxy orbiting around a larger galaxy with 100 times its mass. The upper left panel shows the two dwarfs approaching one another. The middle panel gives the state of the system after 2 billion years, and the right panel shows the appearance of the galaxies after 7 billion years. Bottom Row: Shown is the orbit of the same small galaxy (in white) around the Milky Way today (in yellow), which has 10,000 times its mass. Closeencounters of the galactic kind may explain the existence of an unusual type ofdwarf galaxy, a new study suggests. So-called dwarfspheroidal galaxies are small and very faint, containing few stars relativeto their total mass. Thesestar-deprived galaxies appear to be made mostly of darkmatter ? an elusive form of matter detectable only by its gravitationalinfluence. Dark matter outweighs normal matter by a factor of five to one inthe universe as a whole. Astronomershave found it difficult to explain the origin of dwarf spheroidal galaxies. "Thesesystems are 'elves' of the early universe, and understanding how they formed isa principal goal of modern cosmology," said study author Elena D'Onghia ofthe Harvard-Smithsonian Center for Astrophysics (CfA). 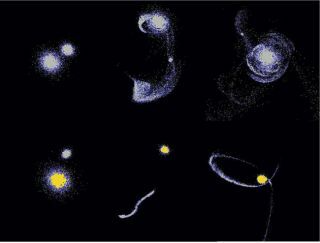 Previoustheories have required that dwarf spheroidals orbit near large galaxies like theMilky Way ? but this doesn't explain how the dwarfs that have been observedin the outskirts of the "Local Group" of galaxies (which includes theMilky Way) could have formed. An encounter between two dwarf galaxies far from giants like the Milky Way, with the dwarf spheroidal later accreted into the Milky Way. An encounter between a dwarf galaxy and the forming Milky Way in the early universe. The teamfound that the galactic encounters excite a gravitational process which theyterm "resonant stripping," leading to the removal of stars from thesmaller dwarf over the course of the interaction and transforming it into adwarf spheroidal. "Thismechanism explains the most important characteristic of dwarf spheroidals,which is that they are dark-matter dominated," said co-author GurtinaBesla, also of the CfA. The longstreams of stars pulled off by gravitationalinteractions should be detectable. For example, the recently discoveredbridge of stars between Leo IV and Leo V, two nearby dwarf spheroidal galaxies,may have resulted from resonant stripping. The team'sfindings were detailed in the July 30 issue of the journal Nature.